The digital camera can be considered as an alteration of the conventional analog camera. Most of the associated components are also the same, except that instead of light falling on a photosensitive film like an analog camera, image sensors are used in digital cameras. Though analog cameras are mostly dependent on mechanical and chemical processes, digital cameras are dependent on digital processes. This is a major shift from its predecessor as the concept of saving and sharing audio as well as video contents have been simplified to earth. As told earlier, the basic components are all the same for both analog and digital cameras. But, the only difference is that the images received in an analog camera will be printed on a photographic paper. If you need to send these photos by mail, you will have to digitally convert them. So, the photo has to be digitally scanned. This difficulty is not seen in digital photos. The photos from a digital camera are already in the digital format which the computer can easily recognize (0 and 1). The 0â€™s and 1â€™s in a digital camera are kept as strings of tiny dots called pixels. The image sensors used in an digital can be either a Charge Coupled Device (CCD) or a Complimentary Metal Oxide Semi-conductor (CMOS). Both these image sensors have been deeply explained earlier. The image sensor is basically a micro-chip with a width of about 10mm. The chip consists arrays of sensors, which can convert the light into electrical charges. Though both CMOS and CCD are very common, CMOS chips are known to be more cheaper. But for higher pixel range and costly cameras mostly CCD technology is used. A digital camera has lens/lenses which are used to focus the light that is to be projected and created. This light is made to focus on an image sensor which converts the light signals into electric signals. The light hits the image sensor as soon as the photographer hits the shutter button. As soon as the shutter opens the pixels are illuminated by the light in different intensities. Thus an electric signal is generated. This electric signal is then further broke down to digital data and stored in a computer. The clarity of the photos taken from a digital camera depends on the resolution of the camera. This resolution is always measured in the pixels. If the numbers of pixels are more, the resolution increases, thereby increasing the picture quality. There are many type of resolutions available for cameras. They differ mainly in the price. 256×256 â€“ This is the basic resolution a camera has. The images taken in such a resolution will look blurred and grainy. They are the cheapest and also unacceptable. 640×480 â€“ This is a little more high resolution camera than 256×256 type. Though a clearer image than the former can be obtained, they are frequently considered to be low end. These type of cameras are suitable for posting pics and images in websites. 1216×912 â€“ This resolution is normally used in studios for printing pictures. A total of 1,109,000 pixels are available. 1600×1200 â€“ This is the high resolution type. The pictures are in their high end and can be used to make a 4×5 with the same quality as that you would get from a photo lab. 2240×1680 â€“ This is commonly referred to as a 4 megapixel cameras. With this resolution you can easily take a photo print up to 16×20 inches. 4064×2704 – This is commonly referred to as a 11.1 megapixel camera. 11.1 megapixels takes pictures at this resolution. With this resolution you can easily take a photo print up to 13.5×9 inch prints with no loss of picture quality. There are even higher resolution cameras up to 20 million pixels or so. The sensors used in digital cameras are actually coloured blind. All it knows is to keep a track of the intensity of light hitting on it. To get the colour image, the photosites use filters so as to obtain the three primary colours. Once these colours are combined the required spectrum is obtained. For this, a mechanism called interpolation is carried out. A colour filter array is placed over each individual photosite. Thus, the sensor is divided into red, green and blue pixels providing accurate result of the true colour at a particular location. The filter most commonly used for this process is called Bayer filter pattern. In this pattern an alternative row of red and green filters with a row of blue and green filters. The number of green pixels available will be equal to the number of blue and red combined. It is designed in a different proportion as the human eye is not equally sensitive to all three colours. Our eyes will percept a true vision only if the green pixels are more. The main advantage of this method is that only one sensor is required for the recording of all the colour information. Thus the size of the camera as well as its price can be lessened to a great extent. Thus by using a Bayer Filter a mosaic of all the main colours are obtained in various intensities. These various intensities can be further simplified into equal sized mosaics through a method called demosaicing algorithms. For this the three composite colours from a single pixel are mixed to form a single true colour by finding out the average values of the closest surrounding pixels. 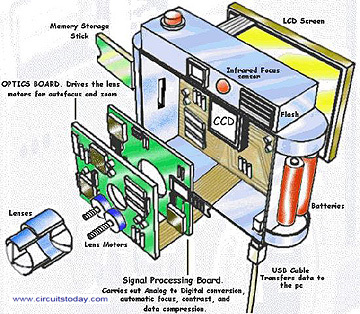 Take a look at the digital camera schematic shown below. Aperture – Aperture refers to the diameter of the opening in the camera. This can be set in automatic as well as the manual mode. Professionals prefer manual mode, as they can bring their own touch to the image. 2. Shutter Speed – Shutter speed refers to the rate and amount of light that passes through the aperture. This can be automatic only. Both the aperture and the shutter speed play important roles in making a good image. 3. Focal Length – The focal length is a factor that is designed by the manufacturer. It is the distance between the lens and the sensor. It also depends on the size of the sensor. If the size of the sensor is small, the focal length will also be reduced by a proportional amount. Fixed-focus, fixed-zoom lens â€“ They are very common and are used in inexpensive cameras. Optical-zoom lenses with automatic focus â€“ These are lenses with focal length adjustments. They also have the â€œwideâ€ and â€œtelephotoâ€ options. Digital zoom – Full-sized images are produced by taking pixels from the centre of the image sensor. This method also depends on the resolution as well as the sensor used in the camera. Replaceable lens systems â€“ Some digital cameras replace their lenses with 35mm camera lenses so as to obtain better images. The picture quality obtained in a film camera is much better than that in a digital camera. The rise of technology has made filming the help of digital techniques easier as well as popular. Since the digtal copy can be posted in websites, photos can be sent to anyone in this world. thank you for giving me knowledge through this web site. it is helpful to me and us. Picture of circuit layout for ease of assembling is required as clarification. please, give the working in detail with circuit diagram .